The Pride 560 Lift Chair is an electrically operated Smokey Dawson chair with reclining backrest, elevating leg-rest and a stand up function. Built with a steel and wooden frame and equipped with a single motor. The Pride 560 Lift Chair is easy to operate and comes with many luxury features. Suitable for medium to larger users. SKU: S7522. Category: Lift Chairs. Featuring a pillow back design with a patented, quiet and smooth lift system. A large side pocket discreetly stores the easy to use hand control that can also be easily moved to left hand side. An integrated emergency battery backup ensures mobility in the event of a power outage. Equipped with a 10 year frame warranty and 2 year mechanism and motor warranty. What is the warranty on the chair? The Pride 560 electric recliner is equipped with a 10 year frame warranty and 2 year mechanism and motor warranty. What is the maximum weight the recliner can hold? 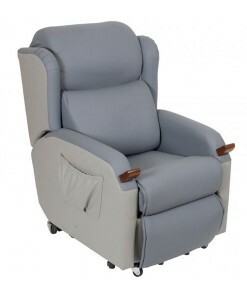 The Pride 560 electric recliner can hold a maximum weight of 170kg.